If you’ve walked over a sand dune on the way for a swim on a summer’s day in Eastern Australia you may have noticed a succulent plant with a spectacular bright pink flower growing beside the path. 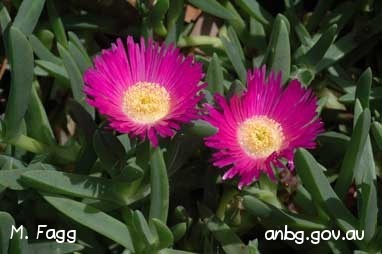 Chances are it was Carpobrotus glaucescens (also known as pigface, ice plant or angular sea fig). And you might be surprised to learn that not only is it native to Australia but it is also edible. The red-purple fruit has a flavour described by some as like salty strawberry or kiwi fruit and by others as like salty apples1. 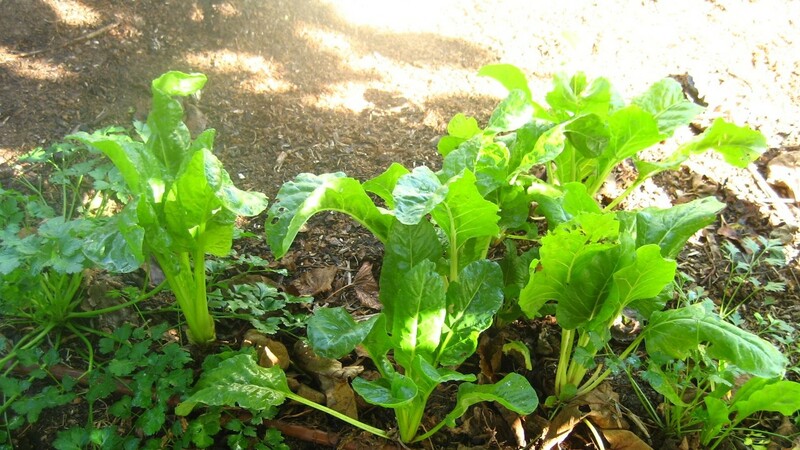 Its thick, fleshy leaves can also be eaten – raw or cooked (the roasted leaves may be used as a salt substitute) and the juice from the leaves can be used to soothe stings or burnt skin2. The juice from the leaves can be mixed with water and used as a gargle for sore throats and mild bacterial infections of the mouth. The fruit has also been used as a laxative3. The prostrate, creeping succulent is one of about 20 species of the genus Carpobrotus, most of which are native to South Africa. Six are indigenous to Australia and this includes C. glaucescens which grows naturally in coastal areas on sand dunes in NSW, Queensland and Victoria. You might get confused if you visit a garden centre looking for pigface as you will mostly find Mesembryanthemum, the genus in which Carpobrotus used to be included. There are 25 species of Mesembryanthemum mostly from Europe but also South Africa. 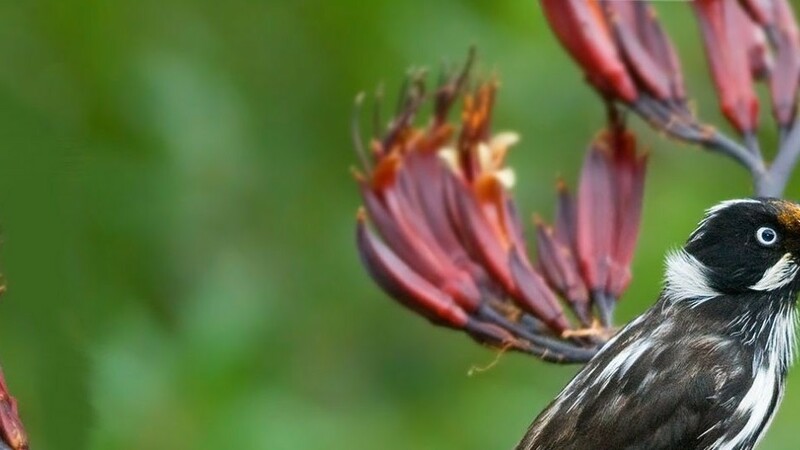 Three species have naturalised in Australia. They are similar to Carpobrotus and are edible too. Carpobrotus is a useful plant for gardeners wanting to avoid using chemical sprays because it is relatively pest free. But there is a chance it may be attacked by scale in summer in which case there are some environmentally-friendly ways to combat the pest: give them a blast with a high pressure hose in the morning three days in a row; wipe them off with a stick; dab with alcohol; or encourage predatory bugs. C. glaucescens likes to be in full sun or part shade in well-drained soil. It grows about 20cm high and stretches about 2m wide. It is very good for rockeries, mass plantings or as a sand dune stabiliser. It tolerates frost, drought, humidity and salt. Avoid waterlogging. The plant produces bright pink flowers in spring and summer. The fruit ripens when the flower is pollinated and spent. The fruiting body swells up and turns deep red, which makes it easy to spot among the green leaves. The fruit was used by native aborigines as a food source. C. glaucescens is an important part of the ecosystem as it helps stabilise the sand dunes and attracts bees and other insects. Anyone foraging for pigface should avoid squashing it and make sure to leave some fruit for the birds and other creatures which help disperse the plant’s seed. C glaucescens can be propagated from cuttings, by layering or by division of large plants. It can also easily be grown from seed. The word Carpobrotus comes from Greek – ‘karpos’ meaning ‘fruit’ and ‘brota’ meaning ‘edible’ and there are other species besides C. glaucescens which have similar attributes. For example, Carpobrotus rossii, also an Australian native, is widespread in coastal areas of southern Australia. Place water, vinegar, sugar, lemon zest pieces, whole cumin seeds and salt in a saucepan and bring to a boil over high heat. Place the sliced endive and pigface in a bowl. Pour pickling liquid over the vegetables and set aside to cool. Once cooled, drain vegetables and remove zest pieces. A tasty recipe for using this pickle as an accompaniment to pork with dates and mayonnaise is suggested on the MasterChef website. Preheat oven to 180 degrees C. Place a jar upside down in the oven to sterilise for 10 minutes. Separately boil water in a pot. Add sugar and pigface pulp to the boiling water.